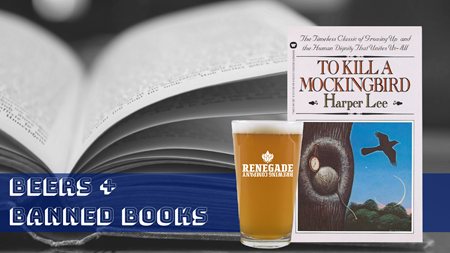 Our third beer/book pairing in our Beers + Banned Books series is To Kill a Mockingbird. Our Squarrel Square Barrel Company themed beer will be our Tequila Mockingbird. A 5:00 Afternoon Ale base aged with tequila-soaked American Oak staves and flavored with lemongrass. The first 40 people to purchase a 10 oz pour of our Tequila Mockingbird beer will receive a worn copy of To Kill a Mockingbird to keep! Every person that purchases a 10oz pour of our special release, Tequila Mockingbird, will receive a worn copy of To Kill a Mockingbird to keep.